Postal address: H-4150 Püspökladány, Farkassziget 3. In Hungary, the red oak (Quercus rubra), the most widespread non-native oak has been grown in forests for more than 100 years. Due to its fast growth, high yield and valuable timber material it is the most important exotic tree species besides the hybrid poplars and black locust. The variations of the natural regeneration technologies applicable in red oak stands should be developed according to the main felling methods and the associated natural regeneration possibilities. In the case of red oak stands the application of clear cutting-like regeneration cutting and shelterwood cutting can be recommended for the practice. 1. Rédei, K., Csiha, I., Keserű, Zs., Kamandiné, V. Á. & Rásó, J. (2011): Local yield tables for black locust at Nyírség. Bulletin of Forestry Science, 1(1): 115-124. 2. Keserű, Zs. & Rédei, K. (2012): Tending operation models for Leuce-poplars under sandy soil conditions. Bulletin of Forestry Science, 2(1): 61-71. 3. Rédei, K., Csiha, I., Keserű, Zs., Rásó, J. & Kamandiné, V. Á. (2013): Juvenile evaluation of micropropagated black locust (Robinia pseudoacacia L.) clones under sandy soil conditions. Bulletin of Forestry Science, 3(1): 89-95. 4. Rédei, K., Rásó, J., Keserű, Zs. & Juhász, J. (2014): Yield of black locust (Robinia pseudoacacia) stands mixed with grey poplar (Populus × canescens): a case study. Bulletin of Forestry Science, 4(1): 63-72. 5. Csiha, I. & Keserű, Zs. (2014): Investigation of rooting zone of forest association growing under drying sandy site conditions. Bulletin of Forestry Science, 4(2): 33-42. 6. Rédei, K., Csiha, I., Kamandiné, V. Á. & Rásó, J. (2012): The effect of intermediate cuttings on the yield and value changes in black locust (Robinia pseudoacacia L.) stands. Bulletin of Forestry Science, 2(1): 81-88. 7. Führer, E., Csiha, I., Szabados, I., Pödör, Z. & Jagodics, A. (2014): Aboveground and belowground dendromass in a stand of Turkey oak. Bulletin of Forestry Science, 4(2): 109-119. Rédei, K., Csiha, I., Keserű, Zs., Kamandiné, V. Á. & Rásó, J. 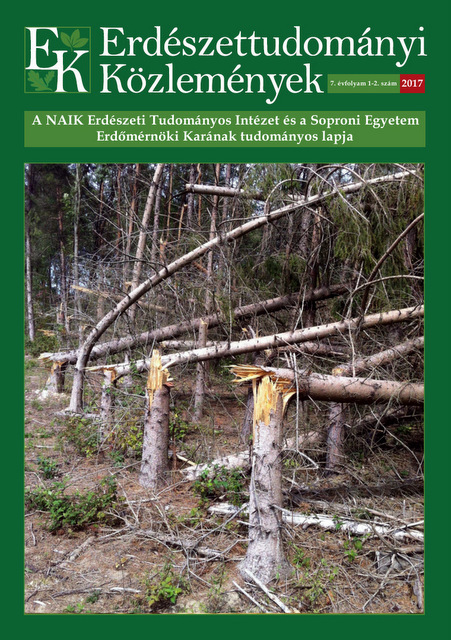 (2011): Local yield tables for black locust at Nyírség. Bulletin of Forestry Science, 1(1): 115-124. Keserű, Zs. & Rédei, K. (2012): Tending operation models for Leuce-poplars under sandy soil conditions. Bulletin of Forestry Science, 2(1): 61-71. Rédei, K., Csiha, I., Keserű, Zs., Rásó, J. & Kamandiné, V. Á. (2013): Juvenile evaluation of micropropagated black locust (Robinia pseudoacacia L.) clones under sandy soil conditions. Bulletin of Forestry Science, 3(1): 89-95. Csiha, I. & Keserű, Zs. (2014): Investigation of rooting zone of forest association growing under drying sandy site conditions. Bulletin of Forestry Science, 4(2): 33-42. Rédei, K., Csiha, I., Kamandiné, V. Á. & Rásó, J. (2012): The effect of intermediate cuttings on the yield and value changes in black locust (Robinia pseudoacacia L.) stands. Bulletin of Forestry Science, 2(1): 81-88.